historical data is king … w/ the correct and long term data we can make some very powerful forecasts and look for patterns that others might not see. 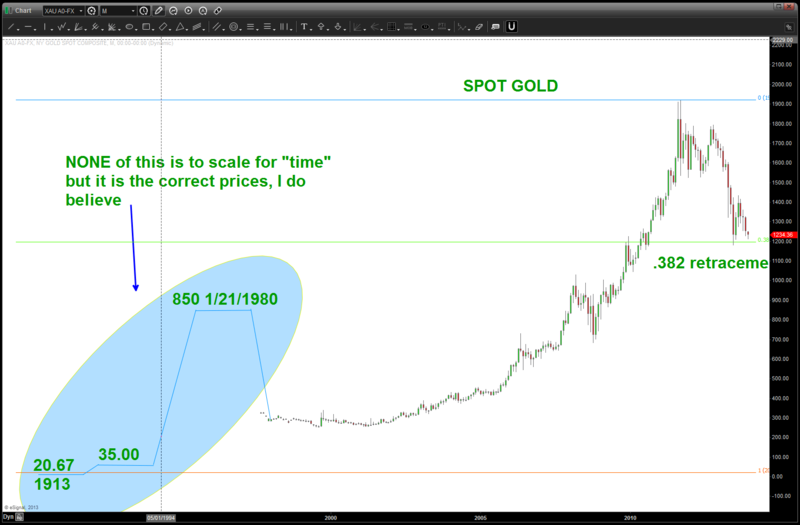 I came across a chart the other day that showed the price of Gold in/around 20 bucks when the FED was created in 1913. so, below I plotted the PRICE action that took us up the low of 252 in 2001. I wasn’t surprised that the recent low in Gold was a .382 from 20 bucks …NOW we can understand why this is an important level. In any liquid instrument that has been on an extended BULL or BEAR run the .382 correction is “usually” a good stopping point and a place to asses market action. strong and powerful trends will hit these levels and resume like a rocket ship. weak trends or shifts from bull to bear or vice versa will, usually, respect the area, but then will give away and continue lower. I really don’t have an opinion on the gold bounce … I do have an opinion on the wave count and that tells me lower, for now. when doing pattern work for this key commodity, make sure to use the 20.67 level. that node will prove to be important again.